DoKaSch Temperature Solutions has gained the Doha-based freight carrier as new customer for utilizing their fleet of active cool containers. The agreement covers a timespan of five years. The contract, which commenced in mid-August, provides QR Cargo with DoKaSch marketed active cool containers of their RAP model and RKN Opticooler. This way, shippers and forwarders that contracted Qatar Cargo for flying their temp sensitive items, can directly lease the DoKaSch provided cool boxes from QR Cargo to having their pharma shipments, medical items or other temp critical products flown with the Middle East carrier within its global network to the destinations required. 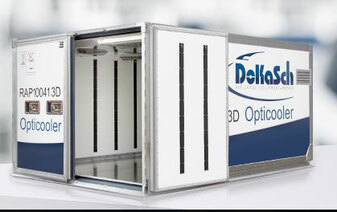 Andreas Seitz, Managing Director of DoKaSch Temperature Solutions adds to this that pharma shippers or their agents now have the option to select a DoKaSch produced and technically maintained Opticooler RAP/RKN as “packaging solution” when they are booking temperature sensitive shipments on Qatar Cargo. “We received first Opticooler requests from QR for a big pharma shipper only a few days after the contract had been signed,” Andreas illustrates. QR Cargo opted for his company’s product because Opticoolers are well established and recognized throughout the pharma and air freight industry “due to their competitiveness in terms of technical reliability, rates, services and availability.” For QR Cargo it is an additional option to generate revenue with high yield pharma cargo. Launched first by Lufthansa Cargo, Opticoolers can meanwhile be utilized by many cargo carriers. Pharma shippers and forwarders are increasingly asking airlines for flying their goods in DoKaSch provided cool boxes, states Herr Seitz. Technically equipped with electric, battery-powered cooling compressors and heaters the active cool containers RAP and RKN Opticooler are not available for sale, but are let-out on a trip-base for a given period of time (several days) only. This is provider DoKaSch’s standard operational and business model for their active cool ULDs. “Once an airline gets a cargo booking in combination with an Opticooler request, the carrier rents the required units for a specific air waybill from us and return them empty to an agreed DoKaSch location,” explains MD Seitz. His company remains being fully in charge of technically maintaining the units during their entire lifetime. Technical and performance checks are made by the provider’s own workforce after every single operation. “This way, we ensure a high technical reliability of our unit load devices,” emphasizes Andreas, pointing out that during the trip-rental, the renting airline is responsible to handle the units with care and according to the operations manual.